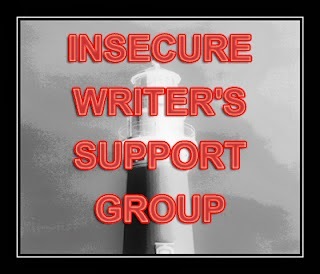 It's the first Wednesday of the month year, which hails the regular arrival of the Insecure Writer's Support Group, hosted by Ninja Captain Alex J. Cavanaugh. The group offers a place for writers of all kinds to support each other in those ever-present moments of insecurity. This month's quote comes from one of my favorite authors, which is not even remotely distinguishing, since he's practically everyone's favorite author. I'm talking about one of this generation's biggest speculative rock stars, Neil Gaiman. "Sometimes writing is like jumping out of an airplane and hoping you can knit a parachute before you crash." And thus, one of my favorite quotes about writing was born. He was primarily referring to his personal writing process (I believe it was in response to a question about whether he uses outlines or not), but I think it beautifully captures the spirit of wordsmithery as a whole. Think about how much of what we do requires that obligatory leap of faith from heights we didn't even know we could reach (often followed by the frantic search for a ripcord that doesn't exist). Even the simple act of sitting down to write in the first place is a blind plunge into the unknown. It requires shutting out other parts of the world that perhaps deserve your attention, setting aside time from the rigors and responsibility of your life to entertain the notion that you have something to give to the empty page. All the while, that little voice prods at you, reminding you of the 'real life' things you could be spending your time on, accusing you of arrogant navel-gazing that will amount to heaps of nothing in the end. These words also capture the sheer urgency for success that many of us feel. The more we try to ignore that nay-saying voice, the louder it gets, and the only thing that will shut it up for good is achieving the goals it tells us we'll never be able to reach. So we clamor for them, strain for them against the weight of the world, and the closer we come to that ripcord, the faster terra firma seems to be rushing up to meet us. I absolutely love what I do, but the self-imposed pressure of my writing career is far more oppressive than any hard-assed boss at any 'real life' job could ever hope to be. So what do we do about this free fall we're in, then? How do we address the rapidly approaching ground in such a way that doesn't result in a resounding splat? Well, as Mr. Gaiman suggests, we get our knitting needles moving. That parachute isn't going to appear spontaneously—we can't wish it into existence. The only way we can spread our wings and float gently across the finish line is through hard work and perseverance. Staring back at the comfortable airplane we leapt from or looking down at the possibility of our impending doom are both exercises in frustration and futility. But if we buckle down and put in the kind of hard work that begets success, we will find that success, one way or another. It's easier said than done, and there's no telling how long we'll have to work at that parachute, but the only guaranteed assurance of failure is resignation. And I don't know about you, but I'm not quite ready to resign. So I'm getting to work on my parachute. Care to go skydiving with me in 2013? It's a long way down, but the view is fantastic. Awesome quote, and an awesome expansion of the idea behind it! Thanks for the encouragement this morning. Wow, I love that quote! That's one I haven't heard before, either. Great post! I just need to decide which plane I am riding now. Well, now's a good time to learn! Thanks for stopping by, Alex. Excellent! Good luck in 2013, Tonja. Awesome quote, awesome attitude -- I'm all for the dive! That's the spirit! Enjoy the view. What a great quote and a very thought-producing post. Thanks, I needed that today! Glad to be of service, E.K.! I'm skydiving right there with you! You hit on one of the hardest parts; closing out all other things in our real life. Everything from the phone ringing to the mailman at the door making the dogs bark. It can take us out of our moment and cause us to glance at our pile of bills that need to be paid or emails that need to answered and on and on it goes. I made a promise to myself that there would be more writing time this year so it shall be! Great post and thank you for stopping by my blog today and welcoming me to the IWSG. It's tough to align our writing aspirations with all of the demands and distractions of our daily lives, but if you can manage it, you'll be rewarded. Sounds like you have a great year ahead of you, Elsie! Great post! I'll go skydiving w/you! :) Happy New Year! Thanks, Celeste! Same to you. IT's very nice to meet you and HAPPY NEW YEAR! New follower here. What a great post and quote. I LOVE the image of falling through the sky and knitting LIKE CRAZY... Thankfully I know how to knit. LOL. And you are right the view is fantastic!!!! Nice to meet you too, Michael. Thanks very much for the follow, and happy writing in 2013! Let's get the year started off right! Yeah, I needed to hear this today. I was just thinking this morning about how I wanted to put my current project on hold until I feel like working on it. It's not going to write itself. Perseverance is the name of the game, Krystal. Keep on pushing all year long! Hi nice to meet you. Thanks for your encouraging comment on my IWSG post. I love the quote. Its true for us writers. Good luck with your writing and goals. Thanks, Rachna! Same to you. I think I need to become a faster knitter. :) I like the quote. Keep working, you'll achieve your dreams. What a great analogy J.W. I can see that for a lot of creative efforts. Thanks, Maurice. I agree, that same feeling of plunging without a parachute can come from lots of artistic endeavors. Everyone needs to get knitting! I love Neil Gaiman. He's very supportive of his fellow writers, too. Thanks for the words of encouragement! You're very welcome, Gwen! And I agree; Neil Gaiman is an inspiring author. I think I'm going to pin that quote on my desktop. Happy New Year! Hope you get some use out of it, Kelley. Happy New Year! Gosh what a great quote, J.W., thanks for sharing! I've already jumped from my plane, and I'm steadily working on that parachute. Here's to a great 2013! You're welcome, Candilynn. Enjoy the plunge! Thanks so much, Yvonne! Much appreciated. I'm always very optimistic at the beginning of a new year. My list of goals for the year is semi-ridiculous, but I fully intend to chase them full sail as long as the wind lets me.